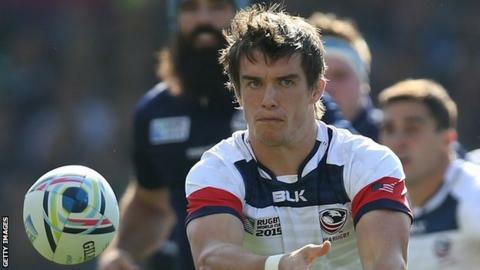 Sale Sharks have signed fly-half AJ MacGinty for next season from Pro12 side Connacht to replace Wasps-bound playmaker Danny Cipriani. MacGinty, 26, has made eight appearances for the USA, including three at last year's World Cup. He has scored two tries in nine league appearances for Pro12 leaders Connacht. "He's the best defensive 10 in the competition, an 80% goal-kicker, has a good skillset and is hard as nails," Sharks boss Steve Diamond told the BBC. Dublin-born MacGinty only joined Connacht in October but his quota spot will be taken from next season by South African fly-half Marnitz Boshoff, who is to join from Lions. "Connacht coach Pat Lam and I had a chat about things - under Irish rugby regulations you can't have two foreign players in the same position," Diamond added. "He played for USA at the World Cup and although he's got an Irish passport he can't play for the national team so they can't contract him beyond this year."